Marbling has always been a bit of a mystery for those who love to create original cloth and papers. Join fibre artist Bethany Garner, as she shares how to create amazing cloth in a clean, safe and fun-filled environment! 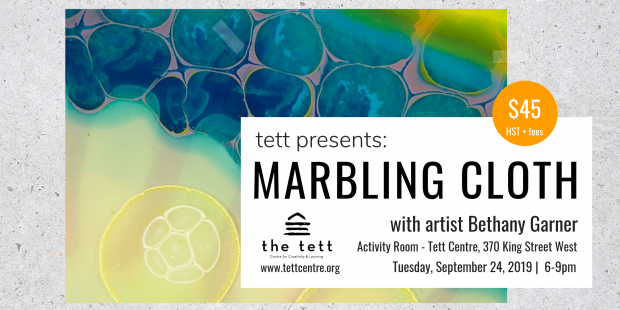 In this popular workshop, you will have the opportunity to explore easy to use marbling paints from PEBEO, a renowned paint developer for the textile arts in France. You will work by layering the paints, using pipettes or eye droppers onto the surface of a pre-mixed, thickened delivery system in a shallow pan. Plus, you will leave with the knowledge to create your own marbling set-up at home. The real MAGIC begins as you layer on pre-cut white, black, or coloured fabrics, or papers of your choice. You may choose to experiment with silk, satin, corduroy, denim, velveteen and more. The results are always beautiful, and can be used in art quilts, journal covers, framed art, and if large enough garments and home décor. This class will be samples focused and follow-up instruction is always available. * Sample papers and cloth included. * Students are welcome to bring their own additional papers or fabrics.